If you have acne-prone skin and try to treat pimples as they pop up — but forget about your skin in between — well, simply put, you’re probably perpetuating a cycle of breakouts. In fact, with acne-prone skin, if you react to a pimple once it reaches the surface, that pimple most likely started forming weeks ago. Even if you are able to manage that one, in another three weeks, you’ll just have another one to contend with. While an acne spot treatment is a great solution in an emergency, simply applying acne medication to parts of the face each time you need it means you’ll never get ahead of the breakout-development process. Instead, developing an acne skin care routine will help you get and keep clear skin. Neutrogena® researchers have discovered you can break the cycle by adopting an acne-prone skin care regimen that fights pimples before they start. Instead of waiting for them to reach the surface, they say, focus on a full-face routine with effective products you use every day rather than resorting to quick fix treatments when a spot appears. The first step to an effective clear skin care routine? The right cleanser — which removes oil and dead skin cells and keeps the pores open — does a lot of the heavy lifting when it comes to acne prevention. Experts recommend salicylic acid cleansers or scrubs, like the classic Neutrogena® Oil-Free Acne Wash Cream Cleanser or Oil-Free Acne Wash Pink Grapefruit Foaming Scrub, which perform the daily duty of removing dirt and grime so your skin never gets congested. The key? Use your desired cleanser twice a day, every day, so the debris never has the chance to build up on your face. If you have mild acne, a medicated wash plus a light moisturizer and sunscreen (try Neutrogena® CLEAR FACE® Lotion SPF 30 for residue-free protection) might be all you need to stay ahead of the acne game. 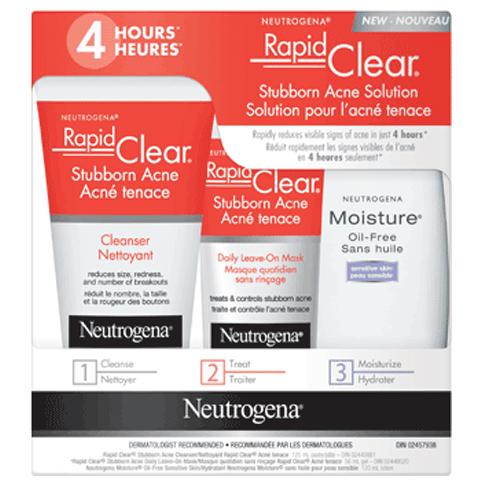 If your acne is a little more stubborn, you might want to follow your cleanser with a medicated treatment, like Neutrogena® Rapid Clear® Stubborn Acne Daily Leave-On Mask, which is formulated with bacteria-busting benzoyl peroxide and designed to be used on all of your face, twice a day, to treat existing acne, prevent breakouts, and help you get clear skin. Even if you’re very broken out, you’ll want to follow your treatment with a light moisturizer and sunscreen, to ensure that your skin is smooth, balanced and protected from UV damage. If choosing the right medicated acne products seems overwhelming, worry not: acne regimen kits like like Neutrogena® Rapid Clear® Stubborn Acne Solutioninclude products that have been designed to be used together, for optimal acne-fighting. Step 3. Finish with the Neutrogena Moisture® Oil-Free Sensitive Skin, to give your skin just enough moisture, without clogging pores. Using this single regimen can eliminate the guesswork and potential confusion about what acne-fighting ingredients and products combine well to create clearer skin results. Whether you decide to choose individual products or a ready-made kit, the key is to use your products twice a day, every day. If your acne symptoms persist despite a consistent effort to address problem areas, it’s best to consult a dermatologist. Great skin isn’t made overnight, but following a daily commitment to your skin’s health almost certainly will pay off over time, with clearer, acne-free skin.